Want to add a little dynamism to the drinks you are serving. 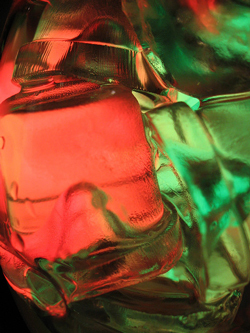 Whether it is for a gathering at home, or for bar, club or restaurant lighting – light up ice cubes add a unique twist. There is also the option to get a little creative and use different colors to coordinate with different holidays or events. An LED light is encased within the cube which will last from 15-20 hours. The batteries are not replaceable so they will have to be discarded – but they can be turned on and off to use multiple times until the battery wears out. The most well known and better quality LED ice cube lights are from Litecube (available from Amazon). 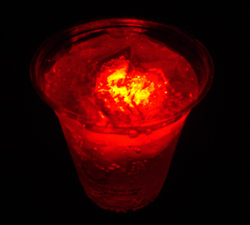 Their ice cube led lights are made from non-toxic plastic and have a gel that is freezable – so they work as real ice cubes to keep drinks cold. The added benefit here is that these re-freezable ice cubes do not water down drinks. They will float while shining their light. Don’t forget you can also have the ice cubes personalized by adding a logo or graphic on them. They cost around $2 a piece – so it is best to buy wholesale if you are using them for restaurant, club or wedding lighting. They are ideal for special occasions rather than daily use as they can be wasteful items. An alternative is to use LED glasses – as the batteries can be replaced so they can be continuously used. You can even have the glasses project a mini light show (see here for LED glasses light show).